One wonders if randomising the tx frequency might not reduce collisions and improve decode rates. Power reported by transmitting stations over the day ranged from 1mW (4 stations) to 1kW (4 stations). 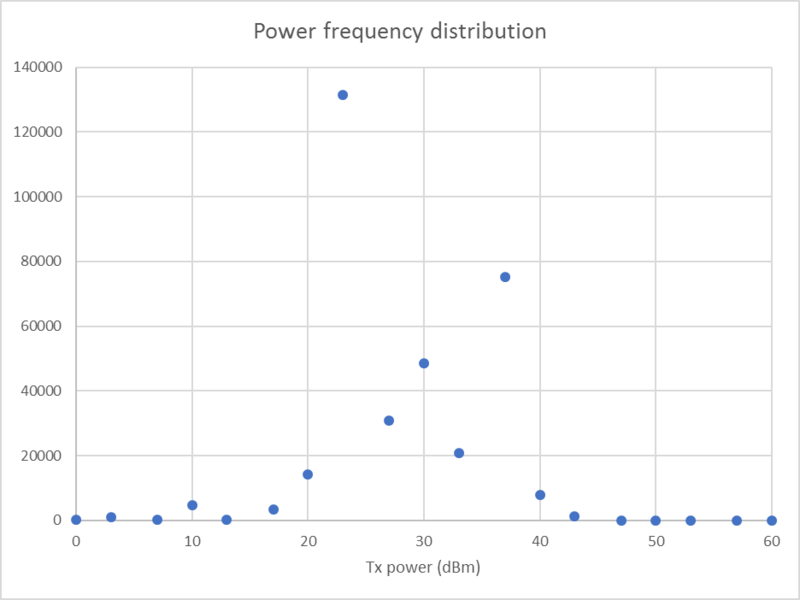 From the frequency distribution above, the most common powers were 200mW or 5W. Comparison would be made with nearby stations that might be expected to experience similar propagation conditions. Because of the volatility of short distance propagation under the present sunspot conditions, receivers less than 5000km will be excluded. In the event, there was only one station reporting a location within 200km, and since the location was in remote bushland 80km from the licence address it was excluded as unreliable (it was also 14dB lower power). Looking more widely, there were no stations active within 500km at around the 5W level. 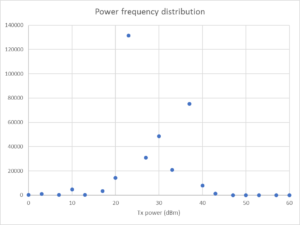 The reports of power of hundreds of watts (eg VK2FPL) raises doubt about the accuracy of the data. 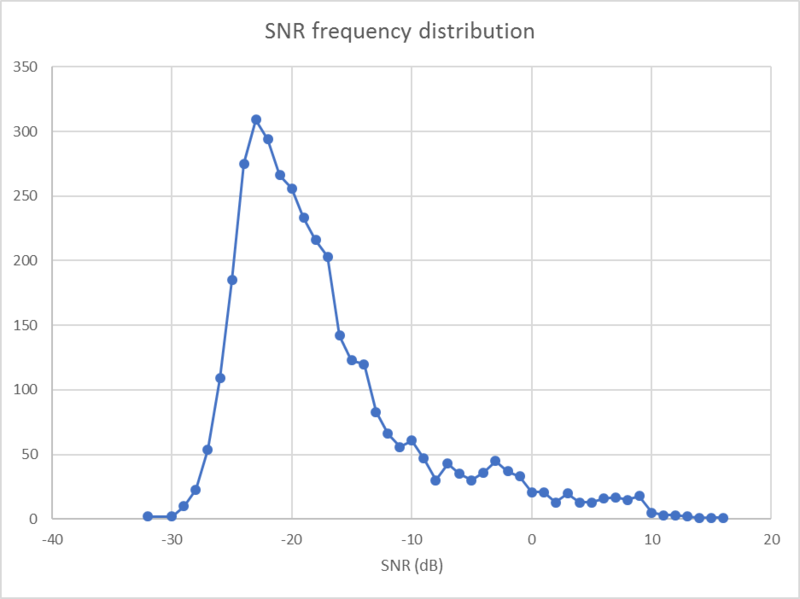 Above is a frequency distribution of SNR. 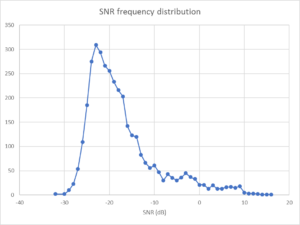 One might expect the frequency of observations to increase with decreasing SNR limited by the decoder’s capability, but the plot above shows that from about 6dB above the decoder’s published ‘brick-wall’ characteristic, probability of decode of off air signals decreases. 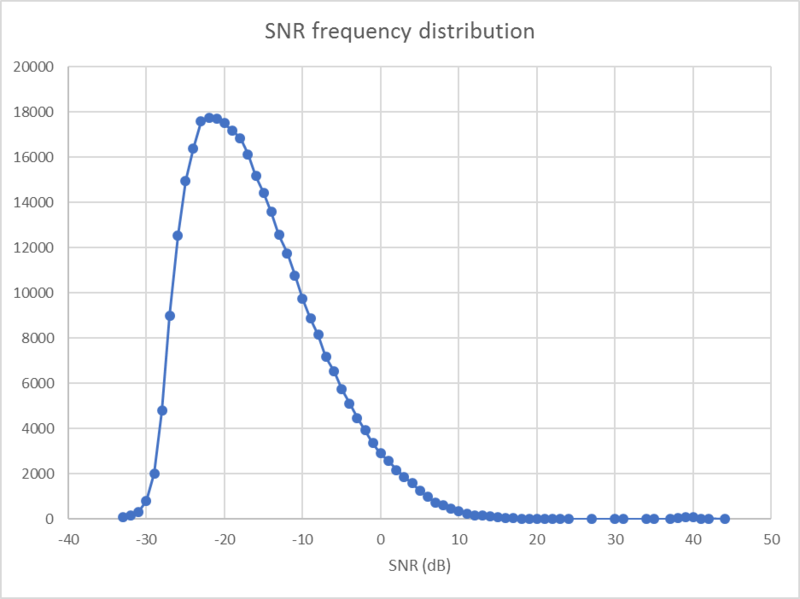 The curve also shows non-linearity above SNR=5dB, so the linear range of SNR is perhaps -5 to -18dB. 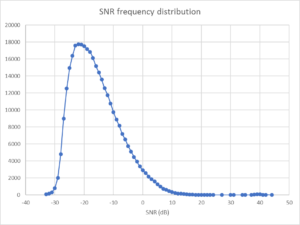 Above is the frequency distribution of SNR for VK2OMD. 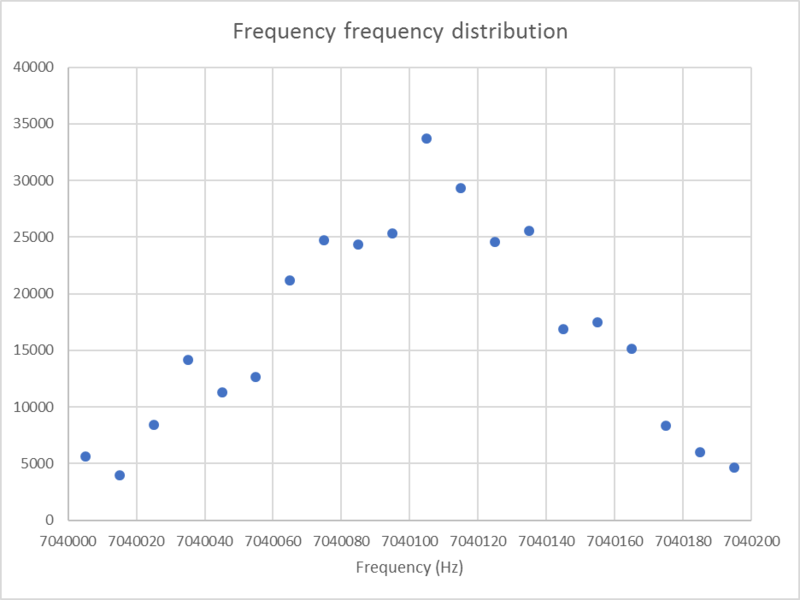 By eye it is not normally distributed (the classic bell shaped distribution) and therefore application of parametric statistics that depend on normal distribution is invalid. Non-parametric statistical techniques will be used. A bare minimum would be 20 simultaneous paired station spots at each receiver. The experiment was conducted on a weekday evening to reduce the risk of interference from contesters who walk all over other activity in pursuit of their single minded purpose. Contests are more likely on weekends. A day early in the month was chosen to make the archive (which is month-to-date) download smaller. Non parametric statistical methods will be used. Because of the limited linearity of the decode process discussed above, spots with SNR outside the range -5 to -18dB were excluded from analysis. 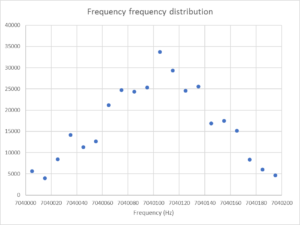 Best results will be obtained from transmitters of similar power leaving more of the linearity budget to other station differences. The transmitter would be set to 100% duty cycle to maximise the number of simultaneous spots. If another station ran at 33% duty cycle, and there was an 80% probability of decode for both stations, then there might be nearly 40 observations over three hours, less for deeper fading or interference, but a real chance of having more than 20 simultaneous spots for the station pair at a receiver. In the event, the transmitter was run from 0600Z to 0900Z as planned, but real time monitoring revealed by WSPRnet maps that there were no other 5W stations operating with 500km. Above is the result after some 3,300 spots of VK2OMD, 22 simultaneous spots from one station with suspect location data and some 14dB less claimed tx power, no conclusions can be drawn, 1 simultaneous spot from a 5W station 870km distant. Here is the Postgres SQL that was used to extract the med_snr_diff reported above. Nevertheless, data was collected and analysed to inform future experiments, The graphs and statistics earlier in this article are from whole day or test period statistics from the archive download. It is possible to extract a median SNR difference for paired observations or simultaneous spots by various receivers, and that might be a useful summary statistic comparing one station with others in the near area. Possible and probable are different things, without coordinating several transmitters, the chance of obtaining more than say 20 paired observations per receiver is low. Experience has been that if participants are recruited publicly, disruptive elements in the WSPR community may spoil the experiment.